Description: The Fulham Palace estate was owned by the Bishops of London for over 1300 years and the Palace was their country home from at least the 11th century. Vacated by the Bishops in 1975, the Palace is now managed jointly by Hammersmith and Fulham Council and the Fulham Palace Trust. Once enclosed by the largest moated site in England, its gardens have been home to many of the country's botanical firsts. The medieval Great Hall has been the scene of royal banquets and supposedly the persecution of protestant heretics whose ghosts are said to haunt the Palace corridors. The surviving building dates from 1495 and is Grade One Listed. Archaeological excavations have revealed evidence of early settlement on the site, both Neolithic and Roman. As Lord of the Manor, the medieval bishops were responsible for law and order, but in return were able to demand tithes and food from the local people. Queen Elizabeth I visited the Palace in 1600. During the English Civil War, bishops were abolished and the Palace was sold to one of Cromwells generals. It was returned to the Bishop of London during Charles IIs reign. By the eighteenth century Fulham had become the summer home of the Bishop, and after the First World War, the principal residence. During World War Two, a barrage balloon site was based at the Palace. After the war, the Palace was divided up and much of it was used as offices. 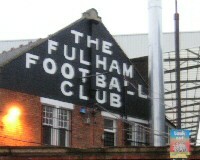 The oldest football stand in London is at Craven Cottage.